A restructuring proposal has been passed at Aberdeen's AGM that will see the club become debt-free. Agreement had been reached with Lloyds Bank, Aberdeen Asset Management and the Stewart Milne Group over the debt and the plan was rubber-stamped at the AGM. Investment from Willie Donald and his wife Elaine, who own the engineering company WM Donald, helped facilitate the debt restructuring. "It's a fantastic step forward for the club," said chairman Stewart Milne. 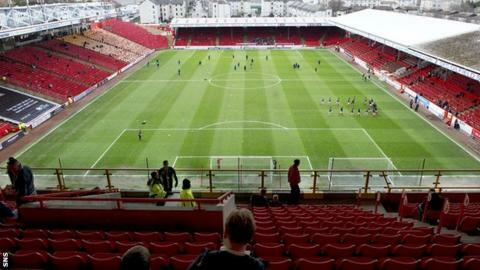 As part of the restructuring plan, the Donalds receive a 20% shareholding in the Pittodrie outfit for their investment. Milne insisted the restructuring plan marks a monumental moment in the club's history. "There's been debt in the club for the past 20 years and it was at a level that was a major burden so to eliminate that puts us in a totally different place." "We've offloaded the best part of £14.5m of debt," he said. "We had a balance sheet before that was worth just under £1.5m, we've now got a balance sheet that's worth close on £16m, so it puts us in a very good position to look at the next key stages that we've got to deliver on - first of all the training facility and hopefully down the line a move to a new stadium. "There's been debt in the club for the past 20 years and it was at a level that was a major burden, so to eliminate that puts us in a totally different place." And the chairman also paid tribute to the Donalds. "They've always been very good supporters to the club," he said. "We always felt that when we got to the stage where we had all the other elements in place, that they would be people that might be in a position to raise the cash that was needed to finalise the deal. "It would be fair to say they took me by surprise when they agreed to deal with the whole thing between them. It's a fantastic thing they've done for the club." Milne also revealed Aberdeen hope to make progress on plans to deliver a new training facility next year. After that is complete, Milne said they would look at progressing plans for a new stadium, with Loirston still the preferred location. "We hope to make real progress on both of these in the next twelve months," the chairman told the AGM. Milne did, however, dash any hopes of an influx of new faces to the playing squad. "Derek [McInnes, manager] has a budget and we review that budget every year, but he knows that's what he's got to operate within and there's not going to be a sudden windfall of extra cash going into the football operation," he added. "We're not going to allow the club to get back into a position where it's running up debt again." Milne, who told the AGM there are no plans to sell off any players, also praised the success of the manager McInnes, who delivered the club's first trophy in 19 years last season with the League Cup. "We've gone some way to restoring the good name of the club," the chairman added. Also at the AGM, Director George Yule was re-elected to the board, as was Duncan Fraser.